When you were growing up, wouldn’t it have been great if you could talk to Santa? This year, the man in red is just a phone call away. So your kids can tell Santa himself what they want for Christmas. 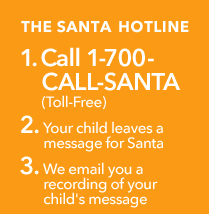 Now through Christmas Eve, they can leave Santa a message by calling 1-700-CALL-SANTA (1-700-225-5726) for free, from any Vonage home phone. They’ll hear a holiday greeting from Santa in his workshop at the North Pole. We’ll also email you a recording of your child’s wish list that you can share with family and friends. It’s a great way to make memories and spread holiday cheer. The fun continues on Christmas Eve. Starting at 5 p.m. EST on December 24, your family can call 1-700-CALL-SANTA to follow Santa and his reindeer on their journey, as they deliver gifts around the world.